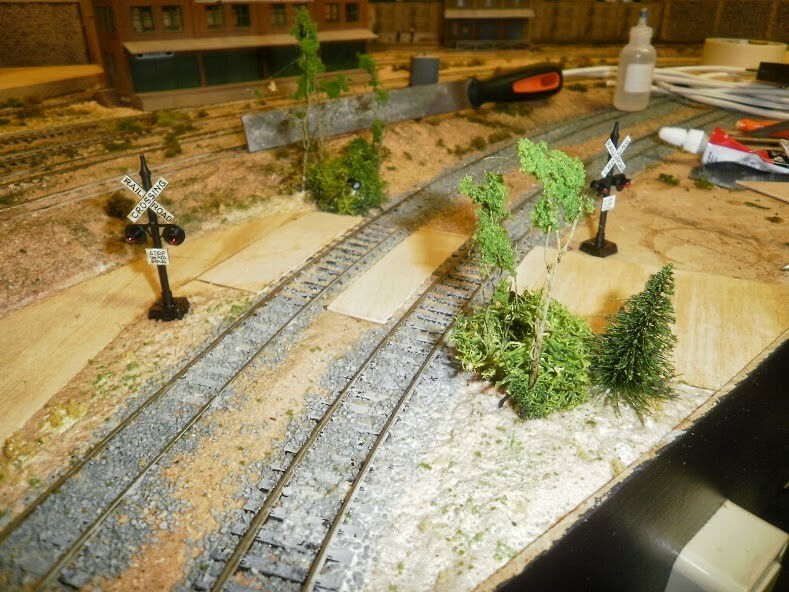 This project uses a Launchpad to drive relays that operate the globe based crossing signals for a double track main with individual track current sensors and the need to sense any equipment that does not draw current that is over the crossing. In this project a LaunchPad, powered from the 5V regulated power supply, will control the 3 12V Relays by monitoring the state of the switched outputs (J4) of two DCC Specialties Block Watchers providing track occupancy coupled with IR detection across the double track crossing operates the two sets of crossing lights and a sound module until a predetermined time is reached after all inputs are restored to an inactive state. 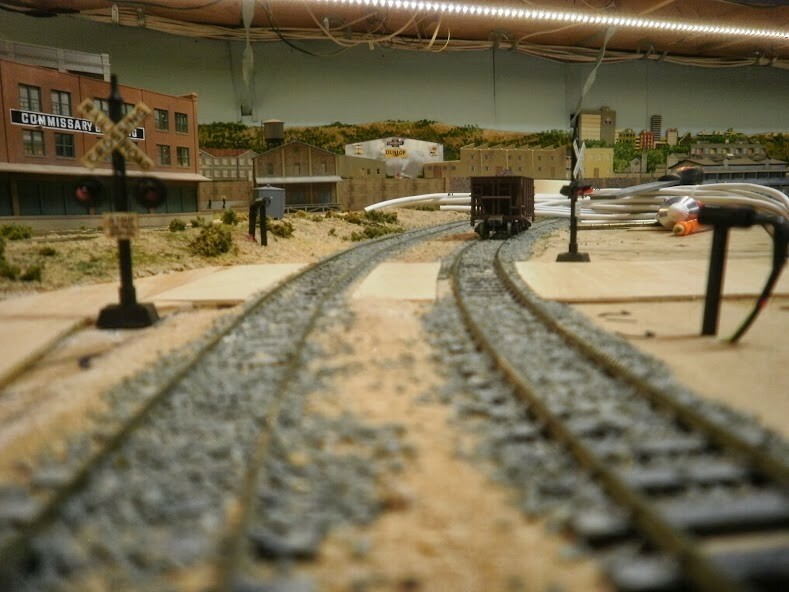 The crossing should operate if Track1 occupied, Track 2 occupied or the IR sensor is active. 1 x LaunchPad with MSP430G2553IN20 processor. 1 x 4 way relay board ( this link ). 2 x switched output e.g. (J4) DCC Specialties Block Watcher ( link ) . 1 x 3mm Infrared phototransistor ( link ). 1 x 3mm Infrared diode ( link ). 1 x 150Ω ¼W resistor. remember to include a resistor to limit the current in the block watcher circuit to protect the LED embedded in the optocoupler. ( links ) were valid at the time of publication. 1 x LM7805CT 5 Volt Regulator. The Power on LED is connected to pin P1.0 and illuminates when the LaunchPad is running the program. 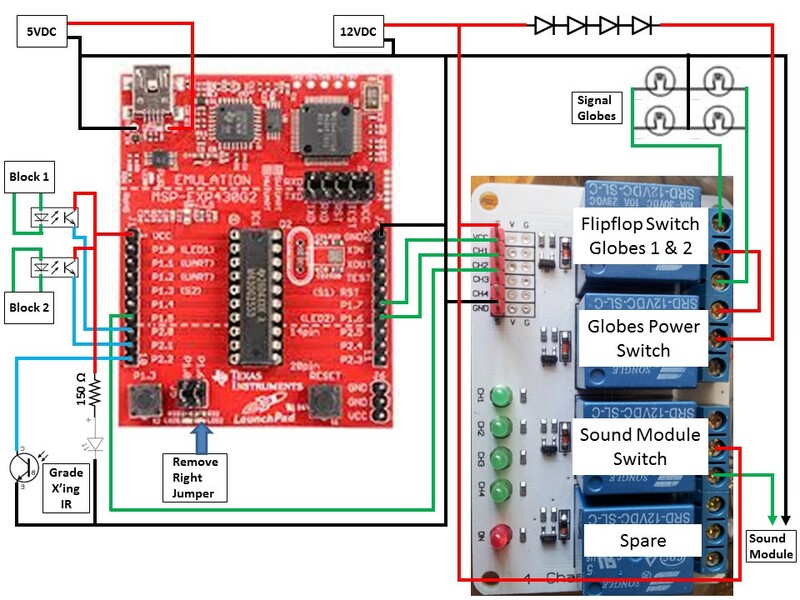 The switched output of each Block Watcher (J4) is connected to the LaunchPad via an optocoupler switching VCC to pins [Board (IC)] P2.0 & P2.1. When a train is detected by a Block Watcher and its switch (J4) is closed the optocouplers operates and causes their respective pins to go “high” and the software in the LaunchPad causes relays 2 & 3 to turn on and relay 1 to cycle off and on for a predetermined time. Similarly if the IR sensor goes “high” it has the same result. This is achieved by monitoring 3 inputs: Block Watcher 1 – P2.0; Block Watcher 2 – P2.1; IR sensor – P2.2. If any or all of the inputs go high: set Inputs_Active (flag) to 1 and cycle light sequence 5 times with the sound module activated. This is achieved by: setting P1.6 to ON (Light power); setting P1.7 to ON (Sound power); and cycling P1.5 ON & OFF 5 times. If any input (P2.0, P2.1 or P2.2) remains high then the sequence is repeated. While the diagram looks complicated, hookup is actually reasonably simple using wire wrap techniques. It is good practice to solder wire wrapped joints for long term reliability once testing is complete. Link to Video of prototype operation. Link to Video of IR operation. Link to Video of Block & IR operation. The code listing follows below. * This code is designed to receive an input from either of 2 DCC Specialties Block Watchers and a IR LED/Phototransistor Sensor pair that turns on the power to light Crossing lights via a relays, turn on a sound module and hold them on for a predefined period of time (currently set to about 3 seconds) after detection ceases. *I have built my own power supply board that utilises one of my 18V 4 Amp AC accessory power circuits and outputs 12V & 5V regulated DC. I drive the lamps from the 12V through four diodes to drop the voltage to just under 10V. I have connected the MSP430 to the 5V regulated supply. * PINS 1.1, 1.2, 1.3, 1.4, 2.3, 2.4 & 2.5 are left unused for integration into other projects.